Back in May of 2013, a new commercial workspace for creatives in Edinburgh called 'Creative Exchange', had its launch night. The event attracted a big crowd of artists, designers, entrepreneurs and educators from the creative industries community, all keen to celebrate the opening of a much-needed, state-of-the-art, affordable business incubator for collaboration and innovation. 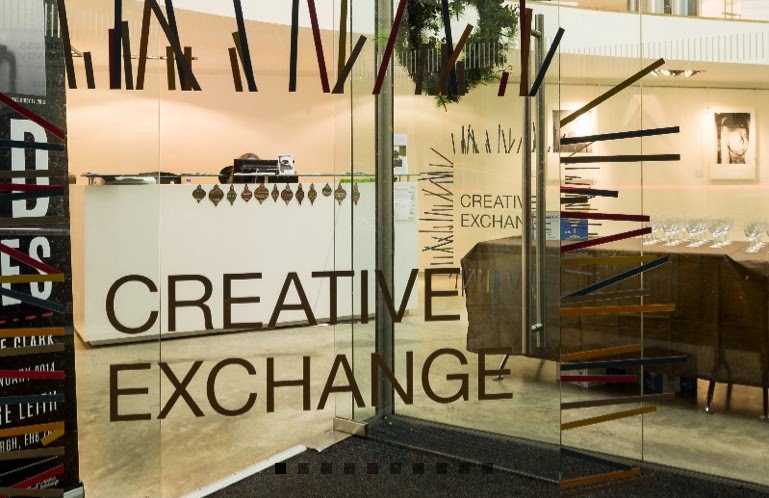 CX is actually a joint venture between Creative Edinburgh, the Cultural Enterprise Office, Edinburgh Council and Edinburgh College, and provides workspace for up to 80 individuals, groups and businesses. As well as ultra-fast 4G broadband and an on-site gallery with an exciting programme of exhibitions, CX is housed in a superb Victorian ex-Corn Exchange building (formerly the head office of the now-defunct creative agency Navyblue). In the run-up top the May launch, the Visual Communication team at Edinburgh College was given the opportunity to be the first educational course to use the space. We hosted a 'one week' project, and exhibited design work at the official launch, alongside our colleagues in the BA Photography course. We also negotiated a dedicated space in CX, which includes a suite of Macbooks on hire for students to work in a self-directed capacity. CX is also very convenient to bring external clients, industry collaborations and visiting educators to, because it's located in the heart of Leith, where many of Scotland's leading advertising, marketing and digital businesses are based. Our upcoming projects at CX include an Interactive Design show (March 7th), a Graduate Review night (April 30th), where a group of design mentors, former graduates and final year students will get together to present and share current and past work, and our end-of-year show on May 29th, a one-night only event (which last year won a commendation for Best Educational event at the Scottish Event Awards). CX has quickly established itself and is now home to a number of creative companies and freelancers, and it's definitely worth checking out of you are an SMS, a start-up, or a freelancer. The CX website at www.creativeexchangeleith.com has a comprehensive pricing guide as well as some excellent visuals of the space. And if you are curious about the CX logo and branding, it was designed by Jon Walton, a Designer at Interesting!, whilst he was completing his HND in Graphic Design at Edinburgh College.